Indoor rock climbing is seen as a safer alternative to outdoor climbing, as it is practiced within a fully controlled environment with the full use of safety equipment. 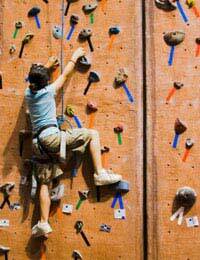 For children who want to learn how to rock climb, indoor climbing gyms can provide a safe way to learn how to do it. Equally important, it's a fun activity that can be performed in virtually any weather! Climbing walls seek to replicate real outdoor climbing structures such as mountains, cliffs and hills. They are artificially constructed with special holds for hands and feet, and there may be places to attach climbing ropes. Smaller climbing walls are often available for children. Believe it or not, climbing walls were first developed in the UK, no doubt because the rainy weather isn't great for die-hard climbing enthusiasts. It first saw the light of day in 1964 thanks to a lecturer at Leeds University who shoved pieces of rock into an indoor wall. The first wall for commercial use was manufactured in Sheffield. Climbing walls today can be made from a variety of materials, including aluminium, plywood, granite etc. The difficulty depends on the whim of the person who built it, so look for an easy grade for your children. They can practice in safety, at their level, with padded floors – and without getting wet! Indoor climbing gyms are accessible to almost everybody. When you begin the climbs will be easier, then you will gradually work up to something more difficult. The first thing to discover is how to use the safety equipment and make safety knots and fasten a harness and helmet. Later on you will begin work under the tutelage of a trained professional. Climbers who just start out can be amazed at how much of a physical workout a climb can be. You will need to stretch to reach the next step, and you will, over time, develop endurance. Some children who have less stamina than others may find this difficult. Take it easy and let them slowly build up to climbs of longer duration. For parents who are rock-climbing enthusiasts, visiting a climbing gym can help them improve their technique and skill level. Going with your kids will not be a wasted activity – and you will have the added benefit of having a hot shower waiting for you directly after your session ends! Rock climbing used to be considered an extreme sport. But these days, thanks in part to indoor climbing gyms, it has become much more mainstream. Children of almost any age can now participate, learning how to have fun while developing their physical prowess at the same time. If your children are fed up with watching telly or feeding the ducks at the park all summer long, why not find an indoor climbing gym in your area? It doesn't matter if you are a seasoned outdoor climber or have never ventured up a mountain before. Indoor climbing is for everyone.